over-excavating, chemically stabilizing, or laying down fabric you could be leaving money on the table... Talk to Tensar about your next project. Not only could you save thousands of dollars but you could win a $1,000! Read on to learn more. You could win our $1,000 grand prize! 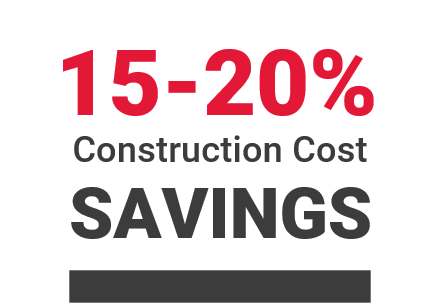 Geogrid provides significant time and cost savings. Geogrid is highly effective at stabilizing poor soils during sitework. It's a Win-Win to Enter! If you're not using TriAx Geogrid to stabilize soft soils on your site, then you could potentially be missing out on thousands in cost savings and adding time to your construction schedule. What could you be missing? Savings this significant are worth another look. Request a complimentary project review from Tensar and you could easily add time and cost savings to your bottom line. Each request is also an entry to our Project Review Contest. The contest will run March 25, 2019 - April 30, 2019. See official Contest Rules for more details. You can over-excavate and import fill, but that is expensive. You can chemically stabilize but even when it works as planned, it can deteriorate over time as precipitation and groundwater gradually leach the chemicals out of the soil. You can try to lay down a layer of fabric and aggregate fill to help you get onto the site, but if the soil is too soft, installation may be impossible. There’s a better answer – TriAx Geogrids. When faced with the cost of losing equipment production time or wasting valuable man-hours, using TriAx Geogrids can be the best decision you make. Since they are easier to install, use less aggregate fill, and require no skilled labor or specialized equipment, TriAx Geogrids help you get in, get out, and get the job done on time. 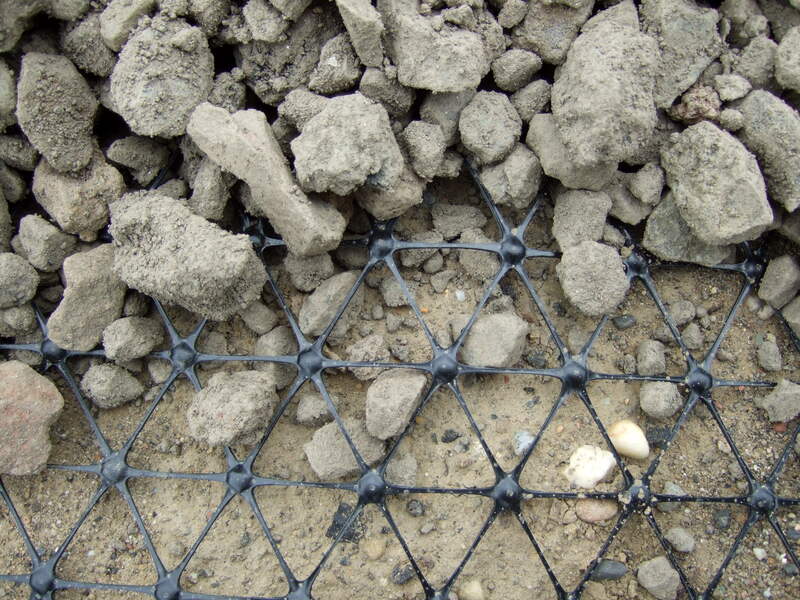 TriAx Geogrid is a geosynthetic material used to stabilize soil. What may look like a simple roll of plastic is actually a powerful, game changing tool. It stabilizes the ground, creating a strong foundation even in challenging soil conditions like weak, wet or compressible subgrades. TriAx has openings, called apertures, which allow aggregate to strike through and provide confinement and interlock of the granular fill. 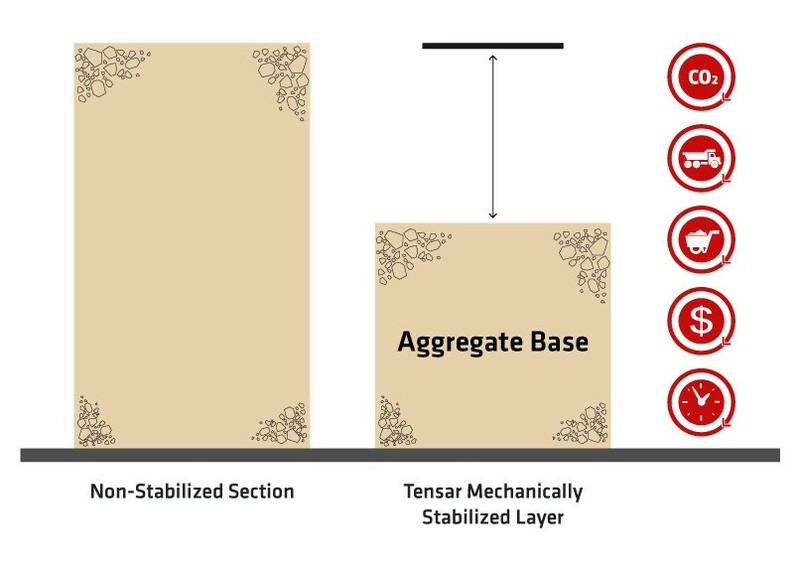 This results in a stiff mechanically stabilized layer capable of controlling differential settlement, reducing road fill depths, and increasing bearing capacity. Its unique triangular geometry, coupled with improved rib and junction geometry, offers the construction industry an improved alternative to conventional materials and practices such as over excavation, chemical stabilization and fabric.